Warning: Some of the images and concepts in today’s article may be considered NSFW. Proceed with caution. Unless, of course, you have been to the Universal Orlando Resort, in which case you know exactly what you are getting yourself into! Enjoy! Recently, I decided to take a look at the former Hard Rock Park and focus on how they pushed the envelope forward to what family friendly could mean to modern audiences. Considering the park didn’t make it past the first season, the world will never know if they took rock n’ roll too far for a theme park… or not far enough. However, it’s not to say that well established theme parks don’t also have some questionable subject matter. 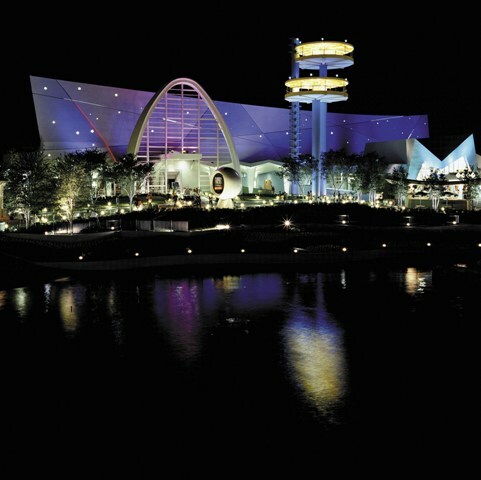 Today’s focus: Universal Orlando Resort in Central Florida. 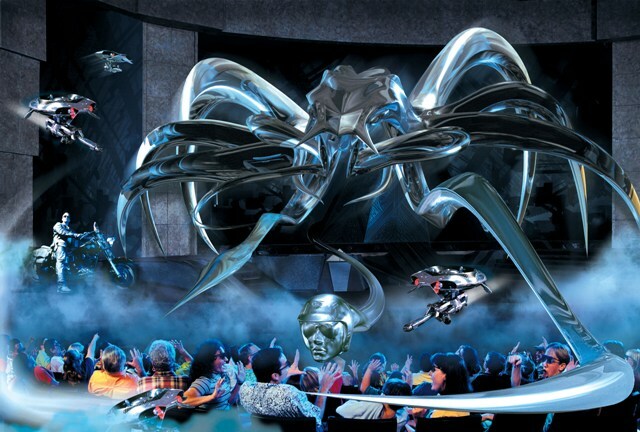 Let’s start with the resort’s newest addition: Transformers: The Ride 3D. In my opinion, this is the most violent attraction in theme park history. From the moment your ride vehicle (also known as EVAC) leaves load, you hear the sounds of bullets whizzing past your head and into the panel in front of you. Granted, the violence takes place in a science fiction universe, so there is no blood shed. 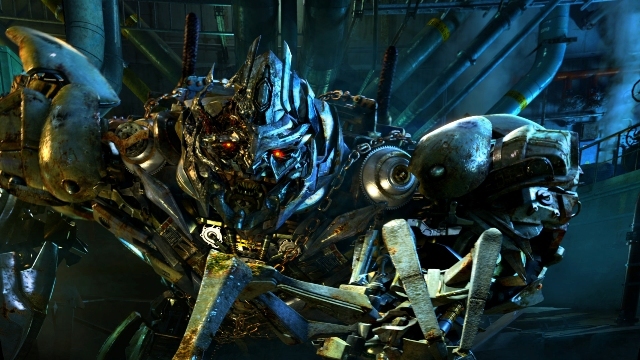 However, there isn’t a single scene in the attraction where Transformers aren’t shooting at each other, your vehicle or physically trying to rip each other apart. True to the films, they leave a ton of CGI destruction in their path. Even though the Transformer films all carry a PG-13 rating, this attraction doesn’t offer so much as a warning for the sci-fi violence. 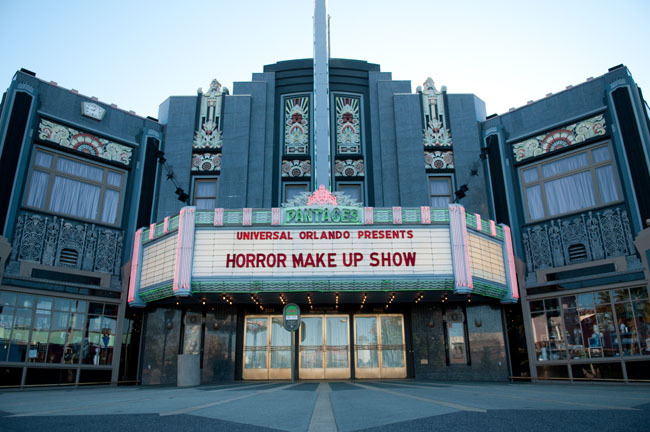 However, there was once a warning for the Horror Make Up Show just down the street from Transformers that the show “might not be suitable for children under 13”. The good news is, this show is one of my favorite theme parks of all time. It’s extremely well written and when performed by the right actors, can literally end in an unprompted standing ovation (I have seen this several times). While Horror Make Up is a comedy, there are some extremely graphic images in a montage of scary films from Universal Studios’ legacy shown that are extremely disturbing. The actors do warn the audience that what they are about to see is graphic, but while the lights are down and the only thing to focus on is the overhead screens, most kids watch anyway. Right next door to the Horror Make Up Show is Terminator 2: 3D Battle Across Time. This ground breaking 3D movie also once had a PG-13 warning on Universal Studios Florida park maps, but again, has since been removed. True to the R Rated films, there is a fair amount of violence including extremely jarring gunfire from a series of robots known as the T-70 terminators scattered around the theater doing target practice directly above the audience’s heads. A few moments later the T-1000, a liquid metal shape shifting robot, appears on stage with may be the loudest shot gun I have ever heard in my life. Then he grabs the host of the Cyberdyne presentation, Kimberly Duncan, by the neck and lifts her 3 feet off the ground and throws her body behind a podium, killing her. True story time: a few months ago, I was walking past Men In Black Alien Attack and decided to stop near a planter, which hid a speaker that happened to be playing “If”. I wanted to make sure that this was the actual version being played in the park or if it was edited in some way. A mother sitting next to me with her 5 year old son in a stroller saw that I was leaning in towards the speaker and said (without me saying a word to her), “Yep, it’s kind of crazy that they play this in a family park, right?” I then told her I was checking to see if they were playing the real thing and she said that as an annual pass holder, that she spends a lot of time listening to these lyrics with her son because he is too young to ride (her husband and older son were on the attraction at the time). She then went on to inform me that, to Universal’s credit, the versions they play in the park are the same versions you can hear on the radio (she’s right). 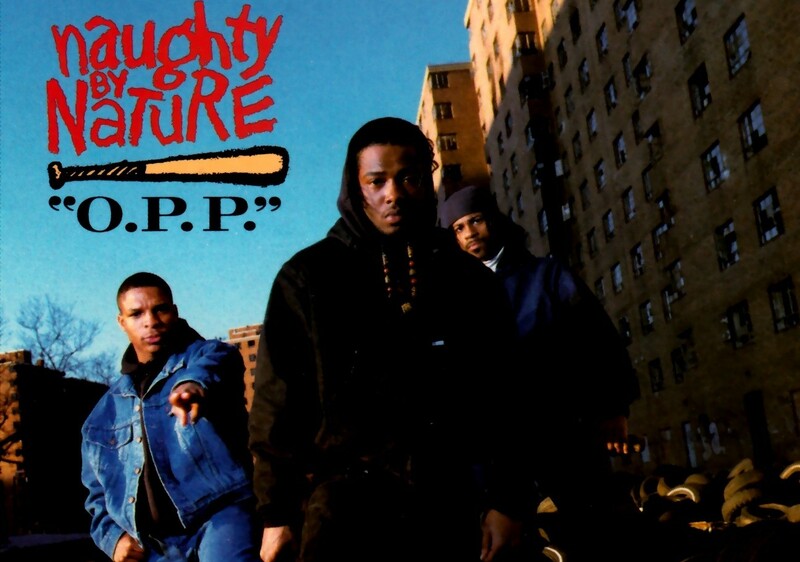 And she has found herself in an awkward position having to explain to what “O.P.P.” means to her young children. This woman brought up a very valid point. If the song comes on the radio, she can change it (and apparently she does), however it’s not exactly easy to just “run away from it” when you are strolling through the park. Not exaggerating, she thought that Universal should post signage stating that they are playing more “adult music” in this section of the park to at least give parents a heads up. While I think a sign will be largely ignored and possibly create more harm than good with children listening more intently (“Mom, what’s a ‘smooth and shiny’?”), I understand where she is coming from. 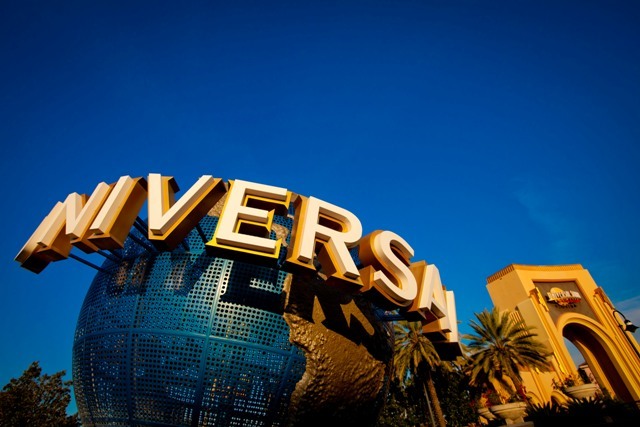 Why Universal ditched the PG-13 warnings for their attractions is unclear. Perhaps it was a shift in management combined with a shift in what society considers acceptable. Either way, while I personally don’t find anything I have mentioned in the article offensive; no doubt, there are families that do. However, maybe it’s to be expected from Universal who is known for catering to a slightly older crowd than Disney down the road. Your thoughts? Make sure to follow Theme Park University on Twitter and like our Facebook Fan Page! This entry was posted in Editorial, Universal and tagged family friendly attractions, Horror Makeup Show, Janet Jackson, Naughty By Nature, PG-13 attractions, Terminator 2 3D, Universal Orlando. Bookmark the permalink. Trackbacks are closed, but you can post a comment. I think you may have mistaken “If” for “That’s the Way Love Goes.” Having worked in that particular area for over 2 years now, I can give you a comprehensive playlist of the World Expo BGM, and assure you that we have brought to the attention of management the inappropriate nature of this music. Their response? “We regular assess and review the music playing throughout our park and make changes only as necessary or thematically appropriate.” …or some variation on that. For 2 years we’ve been fighting to get new music, only to be stonewalled by management that looks but doesn’t truly see. I mean, sure, you can keep “Everybody’s Free,” “Men in Black,” “Request Line,” the MC Hammer songs, and several others, but the borderline offensive songs really -should- get the boot. Honestly, it makes our area seem too much like a museum of the 90s/early 2000s.